Detox products: Multi-Line 5 Drug Urine Screen Test. Pass drug tests, passing all drug test. 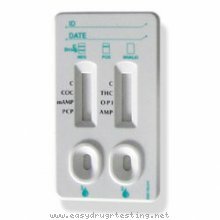 The Multi Drug 5 Drug Urine Multi-Line Screen Test is a simple one step immunochromatographic assay for the rapid, qualitative detection of cocaine, amphetamine, methamphetamines (ecstasy), opiates (heroin, morphine) and tetrahydrocannabinol (marijuana, hashish) drug testing in urine. The cutoff of the test is: 300 ng/ml of COC 1000 ng/ml of AMP 1000 ng/ml of MET 300 ng/ml of OPI 50 ng/ml of THC as the SAMHSA recommended cutoff for these tests are assays cutoff. The Multi Drug 5 Drug Urine Multi-Line Screen Test are more convenient urine drug test, sharp lines, easy to use and read, less customer's mistakes.